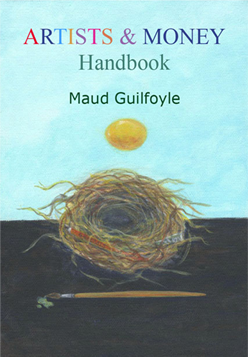 Artists and Money Handbook is the third ebook in a series by Maud Guilfoyle, and is loaded with ideas and tips for generating income, saving money and creating abundance. The author has worked as an artist for thirty years and openly shares wisdom and resources gained from her experience selling art, prints online, writing and teaching. Far from a dry tome on financial matters, Artists and Money Handbook follows this artist’s path from art school graduation to creation of multiple streams of income. Her experience encompasses counting out coins for purchasing art supplies, to selling paintings and prints online and privately. In the resource list of books, periodicals and websites you will find advice and links to such topics as guilds, crowd funding, online income, writing information products, self publishing, protecting your work, and prosperity consciousness.